Google Chrome has come a long way and it still has got more to come starting this 2018. Despite its launch more than a decade ago, it’s only about five years ago that Android users were able to enjoy the goodies of Chrome on their devices. Since then, lots of updates have followed, bringing new features that have attracted millions of users to the application. In fact, despite being very popular, Google Chrome is still one of the most downloaded web browsers and the demand is about to get even higher thanks to the upcoming support for password exporting. 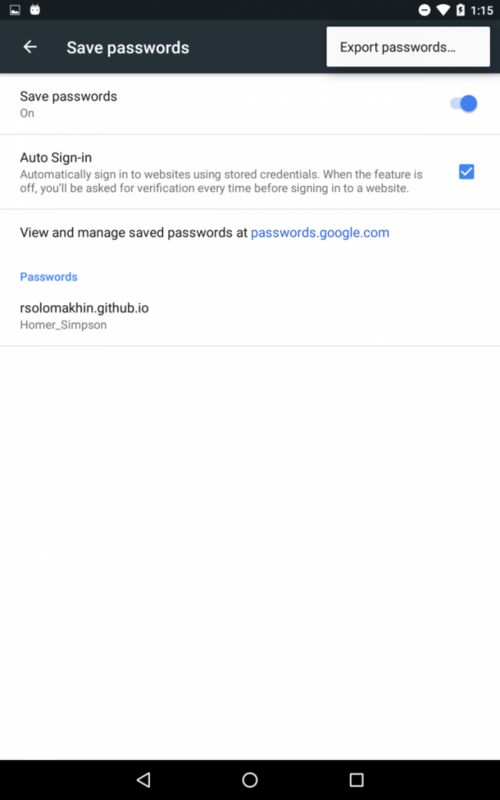 It’s only last month that Google Chrome got an option to view saved passwords, where you can check your passwords even without the need of signing into your account or going to the Google Passwords website. Now, to make things even better, Google is reportedly working on a new feature that will allow Chrome users to export passwords. This is a built-in tool for exporting passwords, but at the moment, it’s still a commit in the Google Git. Once Google is done, Chrome users will see an “Export passwords” button in the top-right corner in the Settings page. When you tap on this button, an export process will be initiated, where a file of your saved passwords will be downloaded to your phone, but for now, it’s still unclear which file formats will be available for users. Prior to Chrome’s expanded support for extensions, third-party applications needed to inject a code into Chrome in order to work accordingly. As it is, those who use Google Chrome with software that injects code to the browser are 15% more likely to suffer from crashes. For this reason, the search giant has initiated plans to block injection of codes by third-party software on Windows beginning this 2018. Google has a timeline of how it will execute this plan. Google Chrome 66 will debut the feature in April 2018, where users will start seeing warnings after the app crashes. This warning will alert them about the software that is injecting code into Chrome and give them an option to update or completely remove it. Beginning July 2018, Chrome 68 will start blocking any of these apps from injecting code into Chrome and in case the blocking affects the browser’s performance, including preventing it from starting, the injection will be allowed. Still, a warning will be displayed alongside a guide to remove the software. The last phase will come in January 2019, where Chrome 72 will completely get rid of all accommodations as well as block code injections for good. Of course, not all third-party software will be prevented from adding code to Google Chrome. Apparently, Microsoft-signed code, accessibility and IME software will be excluded.